Chief Medical Officer (CMO) / Distric Tuberculosis Control Committee Pauri Garhwal has released notification for the recruitment of Medical Officer and Sputum Microscopiest (Lab Technician) under National Tuberculosis Control Programme which is purely on contractual basis. 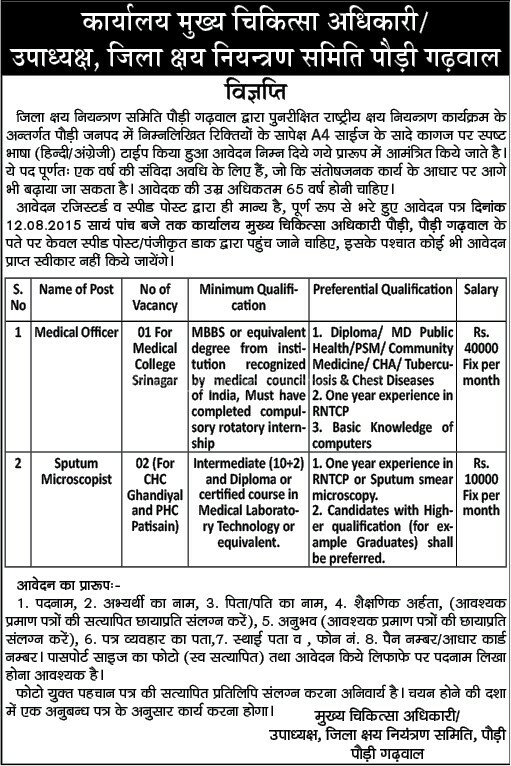 CMO Pauri Garhwal invites eligible candidates for the post of Medical Officer and Sputum Microscopiest. Interested candidate can type an application on an A4 sheet as per given format and send it along with the relevent documents with two passport size photograph. The application should be send before 12 August 2015 in the office of Chief Medical Officer Pauri, Pauri Garhwal by registered/ speed posts only.